* Wearing without the motorcycle pads will also make jacket less stiffer. * Quality strong cow hide leather, that will last long and won't get damaged. * Easy to remove armour padding on shoulders, back and elbows. * Triple stitched stretch panels in the arms, shoulders for comfort and ventilation. * Water-resistant black 3M THINSULATE quilted lining. * Discreet Pockets with hidden zippers for keys, wallets - 2 outside and 2 inside. * Inside back zipper 8 inch for trouser attachment. * Highest quality materials and craftmanship with double and triple stitch seaming. * 120mm Side zippers on wrists and heavy duty grade front zipper all top YKK brand. * Adjustable waist sides allow for custom fitting to your personal preference. * Remove all 5 pieces of armor and use it as a fashion jacket for hanging out when not riding. * Very fashionable unisex REAL leather padded biker pants. * Zip up style front with pockets inside and out with zips. 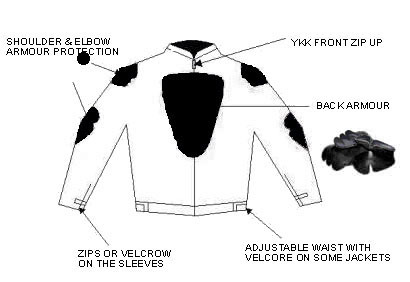 * All labels and designs are embroided or stitched NOT printed. * Easy to remove armour padding on thigh, and knees. * Zips on the ankle. * Great as a casual pants not just for motorcycle use. * Great gift for anyone, can be worn all seasons. 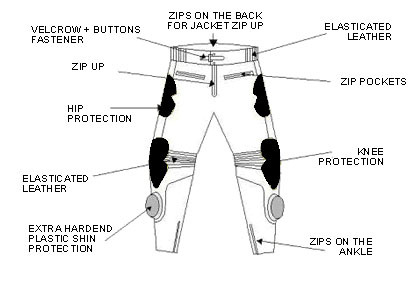 * Removable full armour protection, knee, pelvic & shin (CE approved).All abels and logo stitched and ebmroided.